"What is this?! You dare serve me THIS?! ITS A TRAVESTY!" Bats. Is your pig saying "What do mean, blown up with a bicycle pump? I am big-boned, I'll have you know!" Mine too stomp! I tear the veggies up near the cage and give a little bit to each by hand first before putting the pile in and they go nuts watching me tear up the veggies so near to them! My babes are upstairs where they don't really hear me prepping dinner anymore. No worries though, they get super excited at their cue word, "snaaaaaaaaaaaaaaack." My herbivores get excited when I start singing our Veggie Time song. Timothy runs over to the side of the cage and chews on the bars, and the rabbits start hopping in circles. I toss in whole leaves of lettuce but cut large chunks of other things. Parsley, cilantro and kale go in whole too. Since I only have Timothy at the moment I don't have to worry about veggie theft. He's also really great about eating whole grape tomatoes, in the past I've had pigs (well, Gavin) who would refuse to eat anything that was not cut open. I am just dying to hear Alibabbble's Veggie Time song! I buy a lot of mixed field green's at Sam's and since they're baby leaves, they're usually the right size and don't require further work. It makes life simpler. I will rip some lettuces into smaller pieces and some I won't. Other fruits and veggies, except for baby carrots which are an occasional treat, get sliced or cubed into piggy-sized pieces. Stomp, The Cage Of Mens here approves of anything that is manly. So tearing things up with your bear hands is approved! I think I'll start giving them whole lettuce leaves and watch them try to drag them off some where. My pigs new 'must have' veg. 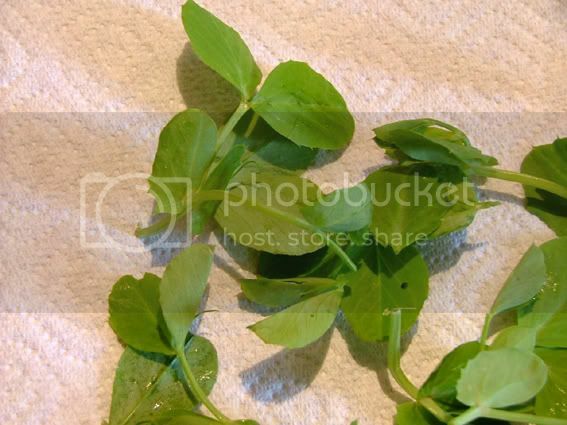 Pea shoots. I rarely chop the greens. I will chop pepper or tomato. Ok, I must be nuts. I buy several kinds of greens, bring them home, chop them, rinse them, spin dry them, then mix all into a big tupperware bowl or bowls. Lola and Nutmeg get a "handful" of the mix twice a day. It's fun to watch them root around their bowls to find just the right piece of lettuce or parsley or kale or whatever to munch first. Nutmeg is, well, a pig--she gobbles her portion down just as fast as she can. She still hasn't learned that the "hand" won't take away the "bowl" and that more food always shows up. Lola, however, is a grazer--nibbles all day. Sometimes I think it is just to torment Nutmeg--like Lola can say "nanny nanny boo boo--I still have veggies and you don't"! That's why they are neighbors and not roomies.